This is a black and white group snapshot. Antoinette (Toni) Ciccarelli is in the foreground holding one of her daughters, Lorraine. Toni has her legs propped up and she is cradling Lorraine between her legs. Toni's hair is done up in with a braid framing her crown; she is wearing a striped outfit that has spaghetti straps. She has no shoes on. Lorraine, also shoeless, is wearing a striped one piece outfit. Both Toni and daughter are smiling into the camera. 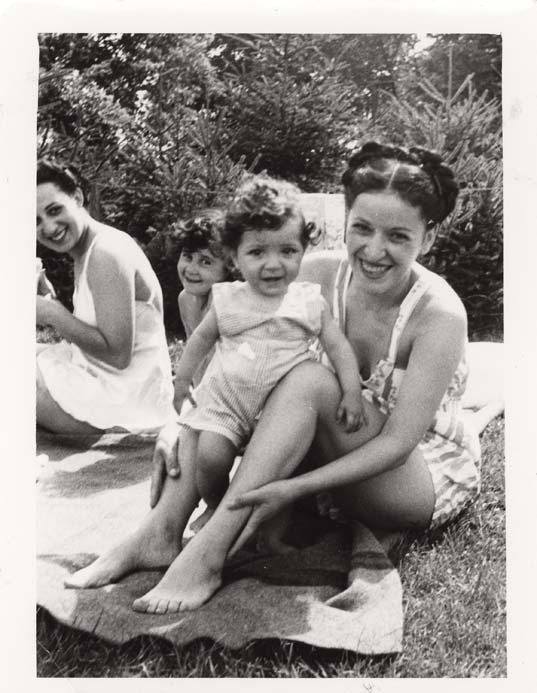 In the left background, a woman is seated and is smiling at Toni and the child. A child is sitting beside this woman smiling at the camera. The group is sitting on a blanket in a grassy area. There are lots of trees in the background.